and helps to prevent foot trouble from occurring. There is a significant difference in body weight distribution when using a DSIS insole (DSIS 3 axis arch pad + heel wedge) and when using a cup insole of EVA. pressure concentrates on the heel could become a cause of Achilles tendon pain. pressure concentrates on the outer arch, causing ankle sprain, triceps pain, and anterior shin splints. Since the weight is not put on the toe, the body weight concentrates on the ball of foot. This may become a cause of bunion, hammer toe and calluses etc. Generally body weight transfers from heel to the outer, but since the weight is not put on the toe, it does not allow the person to walk rhythmically, and easily cause fatigue. Pressure is dispersed, and at this moment the body weight is transferred from the heel to the mid foot region. Therefore the impact in the heel has been reduced, and the pressure to the Achilles tendon is lessened, too. Pressure did not concentrate on the outer arch, and is dispersed in the mid foot. The body weight is smoothly transferred to the toe, so it has reduced the pressure on the mid foot region to a great extent. Body weight is transferred to the big toe, and this has enabled the person to push off the ground. Walking balance is good, the walking pace has become faster, and now it will be possible to do the body weight shift ideally. Pressure is dispersed in most part of the sole. The pressure to the foot has been reduced to a great extent, so the person will be able to walk for long hours, walk faster, walk rhythmically and walk with less fatigue. Foot conditions of people these days depend on whether you are wearing a shoe which is appropriate for your foot or not. Bunion is one of the examples which may explain that using improper footwear could result in foot problems as well as knee pains and waist pains. 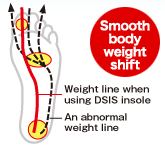 "DSIS" is an idea proposed by an NPO called Orthotics Society. By using this insole which supports "3 arches" in the sole, it adjusts the movements of the foot and it enables to make use of the fingers in the toe. Also it improves walking rhythm and eases the fatigue in the feet. This idea originally reflects the suggestions from staffs at medical sites. So that is exactly what is aimed to be provided in the insole of “Sorbo DSIS series”.